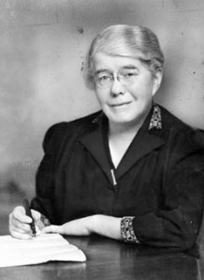 The first appointed woman to serve on the staff of a general municipal hospital in New York City, Dr. Emily Dunning Barringer served the United States as the Vice-Chair of the American Women’s Hospital War Service Committee during World War I. Daughter of Edwin James Dunning and Frances Gore Lang, Dr. Barringer was born in 1876 in Scarsdale into a well-to-do New York family. When her family fell under hard times, with the support of her uncle Henry Sage, she attended Cornell University’s Medical Preparatory course graduating in 1897. After which she attended the College of Medicine of the New York Infirmary, which during her second year, merged with Cornell University School of Medicine. After graduation Dr. Emily Barringer applied for an internship at New York City’s Gouverneur Hospital however her application was denied. However without being deterred, using the aid of Dr. Mary Putnam Jacobi and others, she applied again the following year when she was accepted. In her autobiography Bowery to Bellevue: The Story of New York’s First Woman Ambulance Surgeon she writes that even after her acceptance her fellow residents harassed her in many forms and assigned her difficult schedules and duties. However, instead of staying quiet and turning away, she harnessed the power of her education as well as the necessary help from others, to overcome the challenges that also many other women physicians faced during her era. She became the first woman medical resident in 1902 at the Gouverneur Hospital as well as being the first woman ambulance physician to work there. After Dr. Barringer finished her residency in 1904 she got married to Benjamin Barringer. When World War I broke out in the early 1900s, Dr. Barringer spearheaded a campaign with the purpose of raising money for the purchase of ambulances to be sent to the warfront in Europe. Along with other women physicians such as Dr. Rosalie Slaughter Morton, Dr. Barringer served as a co-chair of the War Service Committee of the Medical Women’s National Association. This committee helped provide medical and surgical care to the soldiers during the war and to the people during the post-war reconstruction. During her distinguished medical career that spanned almost 50 years in length, Dr. Barringer served many roles. She served on as one of the gynecological staff at New York Polyclinic Hospital and after World War I as director of gynecology at the Kingston Avenue Hospital. She also served as an attending surgeon specializing in the study of venereal diseases at the New York Infirmary for Women and Children. And she was a member of the American Medical Association and a fellow of the American College of Surgeons of the New York Academy of Medicine. Dr. Emily Dunning Barringer made significant efforts to help fellow women physicians serve their country during World War II. During that time it was the rule that while women physicians could serve in the Women’s Army Auxiliary Corps as contract surgeons, they could not receive the accompanying military benefits available to their counterparts – the commissioned male officers. In 1941 when Dr. Barringer was elected president of the American Medical Women’s Association, she chaired a special committee that lobbied Congress and Senator John Jackson Sparkman from Alabama for military commissions for women physicians. She fought for a woman physician’s right to hold appointments during World War II in the Army and Navy Medical Corps. And in 1943 the Sparkman Act, which allowed women physicians to be commissioned as officers in the armed forces, was signed into law. Dr. Barringer died on April 8, 1961 in New Milford, Connecticut.